We are so glad you've decided to check out our ministry for 1st - 5th grade! We love God, kids, their families, and having fun! As a ministry, we want to be an outpost of hope for kids and their families to have a better life. Relationships are vital for elementary kids, which is why we have a strong focus on small groups. Our volunteers serve every week with the same group of kids, which allows for relationships to grow with other kids, their leaders, and God. This is also why it is so important for your child to attend the same service each week, so that those relationships and connections can stay strong. Kids Church meets in the Kids Auditorium at both our 9am & 10:30am services. We teach the same lesson and Bottom Line each hour. However, it is taught in different ways and with different small group activities, so that kids who stay both hours will get a unique experience each service, yet still have the same message reinforced. Kids Alive meets in the Kids Auditorium on Wednesday evenings during the school year at 6:30pm. It is an energy-packed night full of games, a Bible lesson, and lots of fun! Click here for a building map to see the location of rooms. Your child's safety is important to us. To help us create a safe environment for your child, our volunteers must complete a background check and training process before they are able to serve. We also utilize a security tag system to ensure every child is picked up by an approved adult. The first step in visiting LCC for any aspect of Children's Ministry is to create a profile for your child in our database. Click on My LCC above and follow the directions to do that from home. Or there will be hosts available to help you at the check-in stations, located in both lobbies. 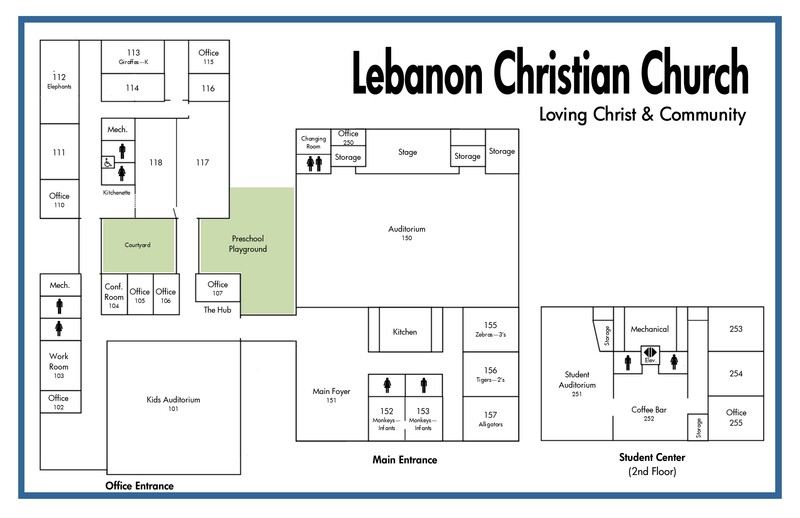 Each time you bring your child to LCC, you will need to stop by a check-in station to sign in your child, where you will receive a name tag for both you and your child. At pick-up, you must present your child's matching name tag. If you lose your child's corresponding tag, you will be asked to present a photo ID in order to receive your child. Thank you for helping us create a safe environment for all our kids. Click below for more information on upcoming events. Our Children's Ministry at Lebanon Christian Church shares the same vision, mission, and values as our church as a whole; we are all heading in the same direction as we follow God's leading. LCC's Children's Ministry is a family devoted to Loving Christ & Community. Rooted - We believe the Bible and prayer are the foundation for all that we do. Welcoming - We will create safe, inviting environments where all people are valued. Generous - We are a community of believers, each committed to investing God's given resources to further His mission. Redemptive - We help all people find transformation in the rescuing and restoring love of God. Loving - We extend Christ's compassion and care through authentic relationships.